Featured Song "The Doomsub's Getting Closer"
"The Venice Menace" is the twenty-fifth episode of The Adventures of Super Mario Bros. 3. It aired alongside another episode of The Adventures of Super Mario Bros. 3 entitled "Super Koopa". Mario, Luigi, Princess Toadstool and Toad are walking through Desert Land, when a gondola comes flying out of a Warp Pipe and lands nearby. When they approach the gondolier, he exclaims that a sea monster is attacking his hometown of Venice. Mario thinks that the gondolier is hallucinating, but the gondolier reassures him that he's being serious. Knowing that Venice might be in danger, Mario gets a strange feeling inside him, and explains that Venice is his second favorite city. Princess Toadstool then sends Mario and Luigi off to visit Venice, but not without them each taking a Frog Suit from Toad. Elsewhere, in an underwater area of the Mushroom World, King Koopa and Kootie Pie Koopa are piloting the Doomsub. Koopa explains to Kootie Pie that his aquatic minions will guard the Warp Pipe leading to Venice while they are gone to prevent the Mario Bros. from trying to go after them while they scare everyone out of the city. Kootie Pie then gloats about how she and Koopa are going to then warp Venice back to Dark Land so that they can turn it into the "Kootie Pie Koopa Waterpark", and she kisses her father's claw. Just after the Doomsub enters the Warp Pipe to Venice, Mario and Luigi show up in Frogs Suits, and are chased around by Boss Basses, Jelectros and Bloopers. After swimming away from the enemies for a while, Mario defeats them by throwing ring coral around their bodies. With the enemies no longer a threat, Mario and Luigi go down the pipe. 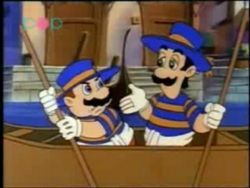 Later, in the canals of Venice, Mario and Luigi are dressed as gondoliers to disguise themselves from Koopa, and are riding around in their own gondola. Mario then brings up how Venice gives him a strange feeling again, as he and Luigi unknowingly pass by the statues of two plumbers who resemble them. Without warning, the Doomsub surfaces and starts chasing Mario and Luigi. Koopa and Kootie Pie are furious about Mario and Luigi making it to Venice, but Koopa manages to close in on the bros.. Mario and Luigi quickly transfer to a motorboat, and flee from the Doomsub in a chase sequence. During the chase, a clothes line gets caught on the Doomsub's windshield, blinding Koopa and causing him to crash. The crash causes a leak in the Doomsub's hull, which Kootie Pie quickly welds back together with a small Fire Bro. While Koopa holds the broken hull in place, Kootie Pie accidentally welds his shell to the hull. At night, King Koopa and Kootie Pie are walking through Venice, when they spot Mario and Luigi spending the night at a hotel. Although Luigi thinks that they defeated Koopa and can return to the Mushroom Kingdom, Mario insists that they stay and figure out what's pulling them to Venice. Koopa then dispatches several Chain Chomps to eat through the poles holding up the hotel, causing it to sink underwater. A Boom Boom knocks on the door, which Mario lets in by accident, along with a Hammer Bro who enters by breaking through the window, flooding the room in the process. As if that weren't enough, the Chain Chomps, along with several Boss Basses, continue to sink more buildings. Mario and Luigi trick the Boom Boom and the Hammer Bro into entering a closet, where they change into their Frog Suits and trap the enemies. They then sneak onboard the Doomsub, while Kootie Pie whines about not yet having her water park. Mario then surprises and taunts Koopa and Kootie Pie, and they chase him into the engine room. While they're gone, Luigi pulls the Doomsub's recall lever, which causes all of the attacking minions to retreat. In an attempt to get rid of Mario, Kootie Pie turns the engine up to full blast, which sends Mario flying into the cockpit of the Doomsub, where he meets up with Luigi. Mario then pulls another lever and flees the Doomsub with Luigi, just before the entire thing warps itself to Desert Land. With their plan foiled, Kootie Pie throws a temper tantrum. Back in Venice, the gondolier from earlier is giving Mario and his friends a gondola ride as a thank-you gift. He then stops in front of the statues that Mario and Luigi overlooked earlier, and explains that they were Marco Polo's Plumbers, and that they brought plumbing back from China to make Venice the city it is now. Princess Toadstool concludes that the plumbers were probably ancestors of Mario and Luigi, and with that mystery solved, the heroes rejoice. Mario says he is glad to get a tour of Venice, Italy, his second favorite city, but his favorite city will always be Brooklyn, USA! On the DVD releases of this episode, a glitch occurs. This happens near the end when the Venice pizza man explains that Marco Polo's Plumbers brought plumbing back from China. This only happens on the Shout Factory and N Circle DVD releases of the complete series. When the gondolier arrives in the desert, he warns that a monster is attacking Venice. However, in the next scene, the Doomsub hasn't arrived in Venice yet. The Hammer Bro is colored as either a Boomerang Bro or a Fire Bro in certain shots. When Mario and Luigi pull the lever in the Doom Sub, their Frog Suits are blue. When Koopa is not looking at the front of the sub, the background is the same as the other scene. During the chase scene, Mario's Venice hat disappears and reappears. When Venice is first shown, the gondola is moving left, then the screen moves right. Once the gondola reaches the end of the screen, it moves right with the screen. When Mario says, "Oh yeah?" before being launched by the Note Block, his mouth isn't moving. One of the famous Italian people that the gondolier mentions is Lou Albano, an Italian-American, who voiced Mario in The Super Mario Bros. Super Show! Toad appears in this episode, but he doesn't speak until the ending where his only line is "They sure look familiar!" This page was last edited on April 13, 2019, at 09:52.